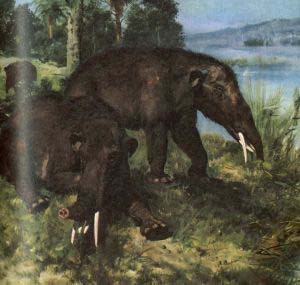 The genus Trilophodon, (from Greek Triloph: meaning three crested, and odon: meaning tooth, refering to the molar tooth belongs to the family of Mastodons (Mammutidae) and is sometimes called Tetrabelodon or Four tusked Mastodon. 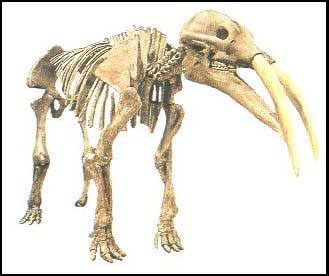 Trilophodon was about 5 m long and 2.5 m high, had four parallel tusks (two on the top jaw, two smaller ones on the bottom jaw) and lived from the Miocene epoch (26 million years ago) to the Pleistocene epoch (2 million years ago) in Europe, Eurasia, Africa, and North America. A complete skeleton was found in Sansan in France, and is exhibited in Mus�e d�Histoire naturelle in Paris, another in Instituto Geologico e Mineiro in Lissabon.